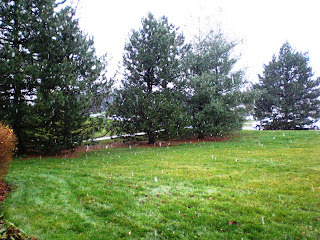 Well, exactly when predicted, it began snowing Saturday afternoon. Jonathan spotted it first. He glanced out the window and then we both went downstairs. We watched the transition from a rain/snow mix to straight snow. Big, chunky, wet flakes. Twenty minutes after it began, I headed out to run some errands, and by the time I got to the mall, it was coming down and sticking to cars in the parking lot. Two hours later when I went to leave, I had a little trouble distinguishing the car... all of them were topped with snow! It was still actively coming down, and I quickly learned that driving in the dark is much more complicated than in the daylight. When I got home, the bushes were covered, the grass was patchy, and the trees were glistening. We got less four inches (I'm guessing more like two and a half? ), and it had stopped completely by the time we went to dinner. There was still some on the ground the next morning, but by Tuesday afternoon most of it was gone and we saw green grass again. This coming Sunday we are likely to have snow again... and it's on the forecast straight through Jonathan's birthday on the 17th! Exciting and scary at the same time. Friends and family continue to offer driving tips, but we're always open-eared to hear more!